A pocket smartphone that can replace a PC - that's the dream for many. But can it work? With DeX, Samsung isn't the first manufacturer to try where many others have failed. We attempted to shut down the PC and work with DeX instead for a day. Samsung DeX was released at the same time as the Galaxy S8 and S8+ and is available for $149.99. 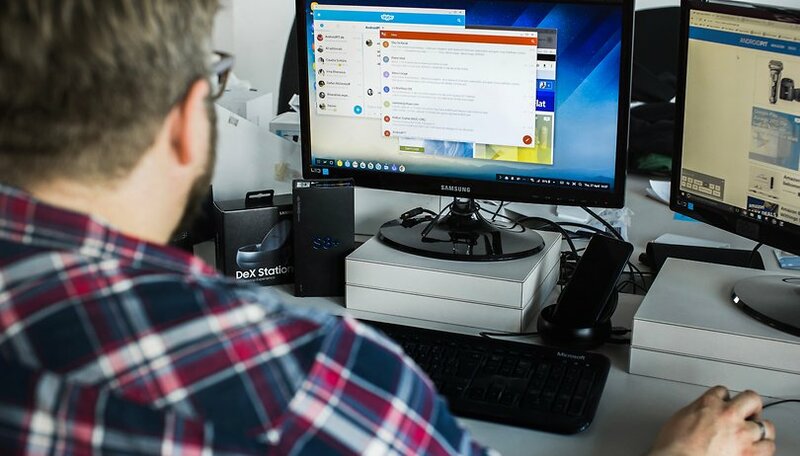 Setting up the Samsung DeX is very simple. Connect the HDMI cable to a monitor, TV or projector, then connect the mouse and keyboard via USB. Attach the power adapter via USB Type-C, slide open the dock and insert the Galaxy S8 or S8+ into the station. Wait until the display from the mobile screen is transmitted to the monitor. When you first use the device, a notice will be displayed but this should only happen once then never again. Also, when the HDMI cable is plugged into either the DeX dock or a suitable monitor or projector, the Galaxy S8 will charge while remaining in normal smartphone mode. Somewhat disappointingly, the resolution when using DeX is limited to full HD and not any more. The smartphone display switches off and stays off while it's connected to the DeX. Pressing the power button when the phone is connected in PC mode won't turn on the screen on either - instead, it actually turns the big monitor off. The Galaxy S8 will need a few moments after being removed from the dock before it turns on again. The desktop looks familiar, almost resembling Windows. The menu bar at the bottom of the screen contains (from left to right): the main menu, Android commands, currently opened apps, notifications, time and calendar. New notifications appear briefly in the bottom right hand corner and can be called up again. Like Windows, the calendar and time can be selected by clicking on the corresponding icon. My main working tool is the browser. For this DeX review, we used Chrome instead of Samsung's own browser, as it supports Google Docs better as well as other tools we use in the office, like our content management system. In our editorial workflow, each process is important - from researching an article to inserting it into the AndroidPIT backend. While using DeX, some websites still recognized the Galaxy S8 as a smartphone, while others displayed the PC version of their website. In general, there weren't any significant problems with using Chrome in DeX mode, although scrolling wasn't as smooth as it usually would be on a PC. In principle, all Android apps that run on the Galaxy S8 should also work on the big screen via DeX. When we tested it however, far from all of them were suitable for full screen use. The system settings, ES File Explorer or Riptide GR:Renegade remained in normal window mode. This isn't necessarily bad, but it is noticeable. Interestingly, ES File Explorer was one of the handful of apps recommended by Samsung as optimized for DeX, which it isn't. It's convenient that many PC commands function with DeX, such as Ctrl+C and Ctrl+V for copy and paste respectively, or Alt-Tab to switch between open apps. This makes working on the DeX surprisingly smooth. Once the Galaxy S8 is pulled from the station and DeX mode ends, the smartphone displays a notice stating that any running apps may have been closed and thus unsaved data may be lost. When we tried it however, all the apps were still open when the Galaxy S8 was reinserted into the dock, even after a full day. Many apps did still need to restart though, so you shouldn't rely on automatic saving. The Google Mail app works really well in full screen. The left bar displays emails and folders and the right bar displays content, which is optimal. All smartphone messenger apps also function with DeX. Whatsapp, Threema, Telegram, Skype and Facebook Messenger are all rendered without any problem. Even classic texting works well on the big display. However, it can get a little annoying when a call comes through. The Galaxy S8 can only pick up a call in DeX mode when the smartphone is coupled with a Bluetooth headset. Microsoft's Continuum is better for this, as the smartphone remains active. It can still be used as a phone, or to simulate a keyboard and mouse. Removing the Galaxy S8 from the DeX station to answer a call is risky for two reasons. Firstly, you may lose any unsaved app data. Secondly, you may miss the call anyway due to the time it takes for the smartphone display to turn back on. The Galaxy S8 comes with MS Office apps, including Excel, PowerPoint and Word. On the surface, these all look good on a larger monitor. Microsoft has an advantage here because of their own solution Continuum, which in principle functions exactly like DeX. Nevertheless, the same problem persists: these office apps will only run on the DeX screen after purchasing an Office 365 subscription. If you're not a paying customer for MS Office, you can only read documents but not edit or save them. Pre-installed apps I have to pay for? No thanks! A few years agon Microsoft decided to make its office apps free for small devices only. This includes devices featuring a diagonal screen measurement of 10.1 inches or less. Since solutions like Continuum or DeX allow you to work on much bigger monitors as the rule rather than the exception, Microsoft has no choice but to charge accordingly. While this of course makes business sense, it's still quite frustrating for the user. As an alternative, Google offers its in-house equivalents: Docs, Slides and Sheets. In theory, these should function with DeX via the Galaxy S8 however, when we gave it a go, they struggled to resize on the large screen. Because of this, the clarity suffered. These apps also responded sluggishly when using larger documents, especially spreadsheets. Editing office documents with either Microsoft or Google apps is definitely not as comfortable as using a PC. The general performance of the Samsung Galaxy S8 with DeX is good. Apps do open slightly slower than usual and may not respond immediately, but when we tried, they nevertheless operated without problems. Similarly, games ran well with DeX on the whole. These could also be controlled with the keyboard, providing the manufacturer had adapted them accordingly. However, not all games were available in full screen. Surprisingly, the Samsung Galaxy S8+ with DeX never heated up much in our tests. The active cooling system in the dock was running but almost silently. With this system, alongside the smartphone's heat pipe and glass surfaces, Samsung has found a good solution in balancing performance and heat. In the end, I couldn't finish an entire work day using Samsung DeX and needed to cancel the test after a few hours. This wasn't necessarily because of the performance, but rather due to many smaller issues. Not being able to take calls without a headset, no practically usable office programs, the lack of a photo editing program, the danger of losing data by carelessly removing the smartphone - all of these things were too much for me, ultimately. Nevertheless, the DeX dock and Galaxy S8+ combination that we tested didn't necessarily leave a bad impression. It's great for occasions where you could benefit from a larger monitor to look at pictures, watch films or even play certain games. But considering this, the question remains whether the dock isn't just a little too expensive. $149 is a lot of money. For that value, customers get a dock made of plastic, without even a HDMI cable or second adapter included. We feel that many customers will not jump on the opportunity. What do you think? Do we really need solutions like DeX or Continuum? Would you personally spend money on one? I use WPS on a Remix Mini for quite a few of my tasks as is, I'm curious as to how well it might help with some of the issues that were addressed. Samsung needs to reenable OTG support so we can plug in a HDMI adapter cable or thumbdrive like I used to on my S5 without a clunky adapter; problem solved! With chromecast, what is the point of that? I believe chromecast has a screen mirroring mode, which gives you 100% -- though as with all screen mirroring i think sometimes sound is out of sync when you do that with video. So I guess i understand a possible need there. As per OTG--I know my samsung supports "WALABOT" (sees through walls to find studs and such) which i think uses OTG - I own one and have tried it out, are you certain it is not supported at all anymore? Have dex and love it.. app support not all there yet (resizable support needed in many apps) .. seems for example nytimes app or gmail app or google plus app all give the tablet experience, and i have hooked up my touchscreen monitor to dex and yes touch support works if you plug usb from monitor into dex. I believe I saw on XDA forums that you can multi click on the dex build number and unlock the dex developer settings. From their you can set it to resize any app. I am surprised none of these articles are picking up on this! I was looking to buy a new monitor anyway, but now I have my DeX, a touchscreen monitor sounds like the perfect solution/combination. May I ask what kind of touchscreen monitor you've got hooked up to your DeX station ? In a word, meh..... It's been tried before with similar results....it just works ok.
when we have earn lot of money thn we try to do something extra from that money and this is the same case with samsung. they already know they have to stick with android to earn a lot of money. Will DeX work with S7 or S7 Edge? I don't believe it will work with S7/S7Edge, I believe it requires USB-C (plus software) to work. It only works with the S8 and S8+. Any chance in hell this thing will work with the S9 or whatever comes next? I'm just sayin, it'd be great if i didn't buy an accessory that dies when i replace the phone. Does it charge mobile phone while it's connected!? Yes it does. It not only fast charges the mobile phone, but also has USB 2.0, ethernet, and USB-C ports. yes, it charge mobile, all cables which you connect to your mobile charging slot to other power giving source charges your mobile. here CPU is a charger so it will charge your mobile also.